Fireplace remodeling design and built at your house. Brick Fireplace remodeling to redesign your current fireplace to remove the dated material. Fireplace remodeling can also be called fireplace redesign or Fireplace refacing. 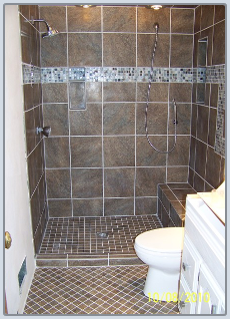 We can help you recreate the feel of the room and add value to your house. When choosing to remodel your fireplace take into consideration that controlling fire, smoke, and high heat is how the fireplace was made to building codes. Fireplace design uses drafting, smoke shelves, non-combustible materials, mantle heights in relation to how far the mantle projects from the face of the fireplace, and hearth design measurements. A remodeled hearth can be altered in size and height but should never be removed completely unless you are planning on adding a sealed gas or electric fireplace insert. Fireplace hearths for wood fuel type fireplaces are there to protect your flooring and house and have minimal requirements that should be closely followed. Fireplace surrounds need to be correctly built. Never should the construction add more chimneys to the design. Wood should never be installed under any surface not visible that is covered by drywall or some other surface. NO FURRING STRIPS OVER BRICK. Brick fireplaces have their own foundations and should have no load from the house structure placed on the fireplace foundation. The house and the fireplace would have been built at different phases of construction. This allows for replacing or remodeling of either structure where the house and fireplace join. When the house was being built and rough framed the wall opening for the fireplace would have resembled a rough framed door opening with a header, jack, and king studs. The measurements determined by the size of the fireplace and K values. Bricks used to finish the outside of your home were then used by the mason to build your fireplace as the exterior of your home was being bricked. The interior of the house was finished by various crews installing insulation, drywall, and trim. The area around fireplace brick is an irregular surface and generally not finished well and covered by a piece of wood trim. Ever notice spider webs at this location? Spiders only build webs where there is air movement. Most drafts felt around the fireplace are from the brick meeting the wall. Remodeling your fireplace can help with heat loss and bugs. Brick on a fireplace conducts heat and cold. In the winter months a brick wall fireplace is cool or cold to the touch as the heat from inside your house is pulled to the outside. In the summer months the heat from the outside is pulled to the inside of your brcik wall fireplace. Remodeling your brick wall fireplace can reduce this heat transfer dramatically. Fireplace dampers on a brick fireplace is a thick piece of steel. This steel rotates open and closed by either a lever or pull chains. Gravity keep the fireplace damper open or closed. As you use your fireplace heat may slightly distort the shape of the steel damper and cause it to not close completely and thus allow the exchange of air and heat. A good set of fireplace doors will stop the loss of heat and improve the look of the room. Fireplace doors can be purchased on line at a reasonable cost. The problem with most doors is that they are made as a one size fits all and look like fireplace doors added to a old drafty fireplace. When you fireplace is remodeled by an experienced fireplace remodeler, fireplace doors can be set into the fireplace surround to look like they came with the house. When fireplace doors are installed with a fireplace remodel, the date is taken out of the fireplace and improves your homes value. Fireplace surrounds can be remodeled with various types of stone around the firebox. Generally and 8" to 12" band, depending on the size of the fireplace firebox opening. Fireplace wood surrounds and wood mantles can be added for as long as the projections out do not exceed the 1"/1" rule. Televisions above a fireplace mantle can be perfomed with a fireplace remodel. Power must be added and chases built to allow for media cables. We have installed many televisons above fireplaces and have all the cables hidden from view. A brick fireplace does not match the decor in the house no matter how many times the fireplace brick is painted. A professionally created fireplace remodel can create the surround to match your decor. Most fireplace surrounds incorporate Granite, Travertine, or Ceramic tile around fireplace openings. 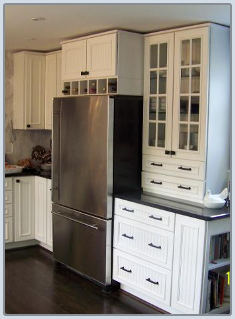 Select hardwoods should be used and never soft woods such as pine. Oak, Poplar, Maple, Cherry, and Ash are the most popular choices. Poplar hardwood does not stain well but is a great surface for painting as it has a smooth grain free surface. when chosing a remodeler for your fireplace make sure they have experience remodeling fireplaces. Ask to see pictures of remodeled fireplaces that they did and not photos of fireplaces remodeled they found on the internet. A lot can go wrong with an unexperienced fireplace remodel, which is the last thing you want as you cozy up to your fireplace for the evening and then go to bed. PROFFESIONAL FIREPLACE REMODELING. SURROUNDS BUILT AT YOUR HOME. NOT A OVERPRICED UNDERVALUED KIT SUCH AS FIREPLACE SURROUNDS FROM THE HOME DEPOT, LOWES, OR SOME INTERNET FIREPLACE SURROUND SUPPLIER. LET USE DESIGN YOUR FIREPLACE AT YOUR HOME. WE CAN INCORPORATE THE INSTALLATION OF YOUR FLAT SCREEN HIGH DEFINITION TELEVISION (HDTV) AND FULL SURROUND SOUND SYSTEMS INTO YOUR CUSTOM FIREPLACE RENOVATION. BRICK WALL FIREPLACE IN NORTHVILLE MICHIGAN. THIS FIREPLACE REMODEL INVOLVED REMOVING THE BRICK. ADDING IN ELECTRIC SERVICE FOR A HD. TELEVISION AND PLUGS ON THE TOP OF THE FIREPLACE MANTLE. CUSTOM WOOD WORKING DONE ON SITE, NOT A FIREPLACE SURROUND KIT. CUSTOM CUT STONE WORK AROUND THE FIREPLACE OPENING AS WELL AS THE RAISED HEARTH. CUSTOM FIT FIREPLACE DOORS. ANOTHER NORTHVILLE MICHIGAN FIREPLACE REMODEL. FIREPLACE DOMINATES THE ROOM WITH THE TALL BRICK AND MIRROR. NEW FIREPLACE DESIGN SOFTENED THE FIREPLACE. CUSTOM BUILT SURROUND AND STONE WORK. THIS IS A 1950'S BRICK FIREPLACE SURROUND. THE DESIGN WAS TO CREATE A FOCAL POINT OF CLASS! BOOK SHELVES WERE CREATED IN FRONT OF THE FIREPLACE SURROUND TO GIVE DEPTH. THE FIREPLACE PLACE SURROUND IS TALLER TO GIVE DOMINACE. THIS FIREPLACE SURROUND WAS BUILT ON SITE OVER THE EXISTING BRICK AND HEARTH TO MINIMIZE THE COST. THIS IS A PLYMOUTH MICHIGAN CONDOMINIUM CLUBHOUSE FIREPLACE. THE INSERT IS AN LED TYPE. THIS FIREPLACE INSERT DEVELOPS NO HEAT AND IS ONLY FOR EFFECT. REALISTIC LOOKING. THIS WAS A FULL WALL FIREPLACE THAT WAS COVERED. THE HEARTH WAS REMOVED. THE NEW FIREPLACE SURROUND WAS BUILT OVER THE EXISTING BRICK. THIS IS A 1940'S FIREPLACE WITH A WOOD BURNING INSERT. WE RESET LEFT THE EXISITING FIREPLACE AND BUILT THE CUSTOM FIREPLACE SURROUND OVER THE FIREPLACE BRICK. BOOK CASES WERE ADDED TO FINISH THE WALL OFF. THIS WAS INSTALLED OVER THE EXISTING BRICK. CHASE WAS ADDED FOR THE CABLES AND POWER NEEDED FOR THE TELEVISION MOUNTED ABOVE THE FIREPLACE. THE EXISTING CROWN MOLDING AT THE CEILING WAS CUT IN PLACE AND THE COLUMNS FIT BEHIND TO GIVE A SEAMLESS LOOK. Your fireplace sets the mood for your home. Why not personalize to your style. This Fireplace remodel is done by completely removing all the brick veneer. We then follow fire blocking codes and create a custom fireplace surround. This Fireplace is completed using Oak that was reclaimed from the Ford Rouge Power Plant. 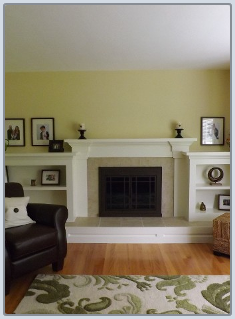 THE ABOVE REMODELED FIREPLACE WAS PERFORMED AT A HOME IN CANTON MICHIGAN. THIS FIREPLACE REMODEL IS ONE OF OUR EXTREME REMODELS. THIS FIREPLACE REMODELING PROCESS WAS A COMPLETE FACE REBUILD. 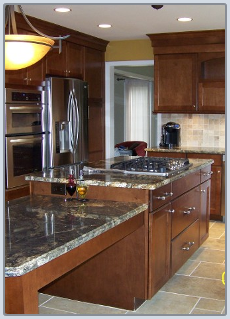 GRANITE AND OAK WAS USED FOR THE SURROUND. SOME OF THE OAK FOR THE SURROUND IS CLOSE TO 350 YEARS OLD. THIS FIREPLACE REMODEL ALSO INCLUDED EXTRA UPGRADES SUCH AS DUCTING HEAT EXCHANGER FROM THE WOOD BURNING FIREPLACE INSERT INTO THE FURNACE DUCT WORK. THIS PRODUCES ENOUGH HEAT TO KEEP A 1600 SQUARE FOOT CANTON MICHIGAN HOME. WOOD HEAT FROM A REMODELED FIREPLACE IN MICHIGAN CAN BE A GREAT ASSET. MICHIGAN HAS AN ABUNDANCE OF WOOD. WOOD IF LEFT TO DECAY ON THE FOREST FLOOR WOULD RELEASE THE SAME AMOUNT OF CARBON INTO THE ATMOSPHERE AS BURING THE SAME WOOD TO HEAT YOUR HOUSE THROUGH A WOOD BURNER INSERT. SOME FIREPLACES QUALIFY FOR THE $1500.00 TAX CREDIT FOR HEATING WITH A SOLID FUEL. VISIT OUR OTHER WEB SITE AT: www.parkohome.com FOR MORE INFORMATION ON FIREPLACE REMODELING. The fireplace is one of the coziest, visible, and practical areas of your home. A fireplace remodel is great to vamp up your old fireplace. There's also more than one way to remodel a fireplace, and by considering the current condition of your fireplace and its use, we will be able to determine what your fireplace really needs. A fireplace remodel can mean many things. Even replacing or upgrading your fireplace surrounds can take on many levels. A new and/or improved fireplace mantel can greatly enhance the look of your fireplace.